Complete fissure of the lower jaw; the tip of the tongue attached in front of the hyoid bone; operation; cure. Description : 291-292, [1 l.] pl. ; ill.: 2 photo. ; 23 cm. Photographs : 1 heliotype leaf with before and after portraits of the surgical patient. Subject : Jaws — Congenital abnormality; surgery. 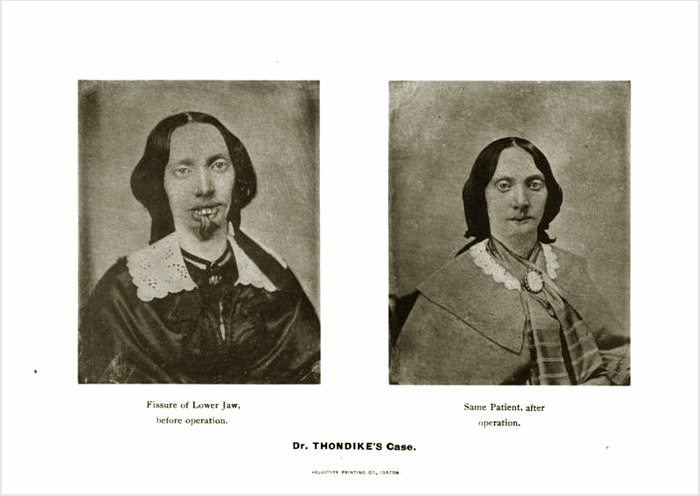 Author caption: "Miss X., aged 28, sought relief of Dr. Thorndike for a congenital fissure of the lower jaw..etc." Visiting Surgeon, Boston City Hospital, 1866-1884. Thorndike Memorial Laboratory dedicated in 1923. Photo caption: Dr. Tho[r]ndike's Case | Heliotype Printing Co., Boston. Photo caption: Fissure of Lower Jaw, before operation | Same Patient, after operation. Obituary notices written by Drs. Cheever and E. H. Bradford in the Boston Medical and Surgical Journal (vol. 112, 1885), extolled several innovative surgeries that Thorndike accomplished during his professional years, including what may have been the first operation for the removal of a fibroid tumor adherent to the peritoneal layer of the stomach wall. However, Thorndike's greatest legacy is the money his brother bequeathed in his name for the construction of a clinical laboratory on the grounds of the Boston City Hospital. The facility's association with Harvard and its propinquity with the patient population of an urban hospital made the William H. Thorndike Memorial Laboratory the most prestigious in the nation. Thorndike's name was also endowed by his son, Townsend W. Thorndike (1872-1929), for an annual prize awarded to the Harvard medical student with the best essay in surgery.